Nucleon DS Studio is the extended version of Nucleon BI Studio with data science specific features and modules. DS Studio supports all BI Studio modules and provides more scripting and data analysis tools for Data Engineers and Data Scientists. Data Science Studio is designed and developed for developers, data scientists, mathematicians, statisticians and other data science related people with scripting and programming background. It allows deep data analyses with scripting and plotting. Yes, stop hacking your scripts and tools. Start working with your data and database with Nucleon DS Studio. Nucleon DS Studio comes with native supported database drivers and data source connections to open protocols, scripting features. What makes the Data Science Unique? It allows you to bind and extract your database data into your script. It allows you to run scripts again your database our data source. It allows you to run third party applications and interpreters which give you to power of scripting freedom. Nucleon DS Studio supports F# Scripting language for data analysis, data mining and information retrieving. F# is .Net based powerful scripting language with functional programming features. 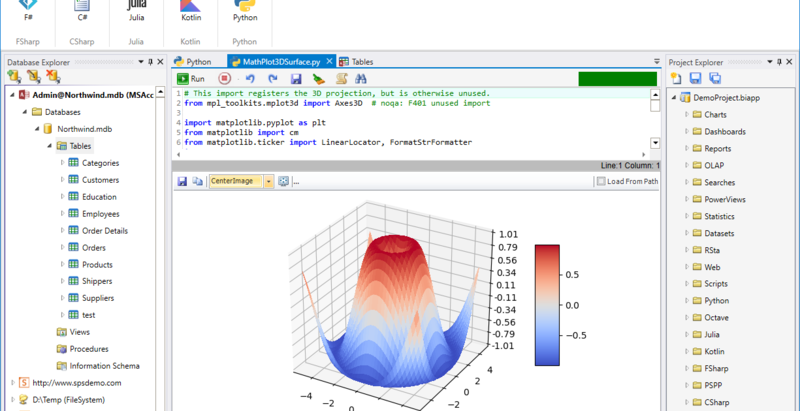 Nucleon DS Studio supports Python Scripting and Plotting. Python is today the default scripting language for data scientist people. You can run pure Python scripts with its package and get the result into report or charts. Nucleon DS Studio supports Julia Scripting and Plotting. Julia is new star for data scientist and data engineers which has powerful scripting features like math expression or distributed parallel computing. Kotlin language provides powerfull scripting features like Julia and compatible with Java. It is also a nice language for data analysis and data visualization. Math.NET Numerics is an open-source numerical library for .Net environment. Nucleon DS Studio supports Math.Net for data related scientific computing and calculations with database systems or files. Nucleon DS Studio supports Octave scripts which support MathLab and Octave scripts for mathematical computing and data science. PSPP is a Open Source statistical computing and analysis tool which can run SPSS scripts. Nucleon DS Studio supports PSPP for statistics and can render the PSPP results which can be used for further reporting, dashboarding, charting, cross table analyses and usage.